Novissima et Accuratissima Totius Russiae vulgo Moscoviae tabula a Justo Danckerts, Amstelodami - DANCKERTS, J. Title : Novissima et Accuratissima Totius Russiae vulgo Moscoviae tabula a Justo Danckerts, Amstelodami. Map maker : DANCKERTS, J.. Size : 19.3 x 22.6 inches. / 49.0 x 57.3 cm. 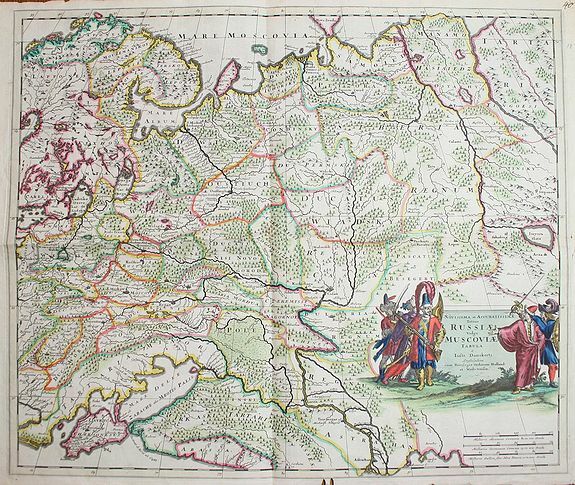 Description :An authentic old map covering the entire Russia of early 1600s, i.e. from Novaya Zemlya in the north, to northern shores of the Black Sea & Caspian Sea in the south, and from the Chernigov lands in the west, to the Urals in the east. Colourfully ornamented with the address of Justus Danckerts (1635-1701) and a very decorative title cartouche. UNCOMMON. The cartographer of the map was Isaac Massa (1586-1643), a Dutch traveler to Russia. Condition : Good condition: hard firm paper, evenly bright colours everywhere, no stains, no holes, etc. Only two small tears on the outer margin which do not reach the printed image itself.